KX15 is a complete wire tracing equipment with integrated field phone. It is specially designed for cable jointing & splicing work. By using KX15 technicians can quickly indetify right pairs before jointing, particularly with thick multipair cable faults. KX15 consists of a transmitter KXT15 and receiver KXR15. 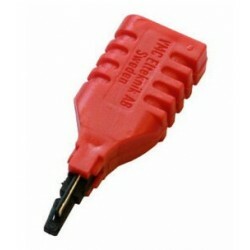 It combines all necessary functions for testing and identifying wire pairs in the field. Above illustration shows the standard way of using KX15 for pair tracing: After speech communication has been established (A) and (B), (A) connects sending signal to the pair to be traced. (B) can now find the pair with the capacitive probe. When (B) short-circuits the found pair, transmitter will indicate the short-circuit with clear beep as verification. Above illustration shows a galvanic checking method of unused (cold) pairs. By using the step-by-step procedure shortcircuits, cut wires, cross connections and ground leaks can be detected. With special accessories KX15 is suitable for locating cables and detecting pipe blockages. KX15 can be used also to trace and identify cross-connection pairs and terminal blocks like in the below image. The high impedance, interference-free listen mode of the transmitter KXT15 enables the user to monitor pair before actually sending any signal to it. It is important to use this feature first with pairs that are in use, as in send mode the transmission disturbs possible communication. If there is DC-voltage on the pair, one of the external voltage LEDs will be lit together with polarity indication. Correspondingly, if there is data on the pair, a special data LED will be lit. Speech e.g. on telephone pairs can be heard through the loudspeaker or headset. 1. Saatja KXT15, 1 tk. 2. Ühendamisjuhe PJ15p (RCA / 2x4mm banana, 1.5m), 1 tk. 4. Juhe kõneside jaoks PJ15 (RCA / banana plugs, 1.5m), 1 tk. 5. Kõrvalklapid mikrofoniga HM12 (3.5 mm pistik), 1 tk. 6. Kasutusjuhend Inglise, Soome, Rootsi või Vene keeles, 1 tk. 7. Kandekott KPP5 (nailon, 240x130x180mm), 1 tk. 1. Vastuvõtja KXR15, 1 tk. 2. Juhe kõneside jaoks PJ15 (RCA / banana plugs, 1.5m), 1 tk. 4. Juhe sondide ühendamiseks AK1 (BNC/BNC, 1.2m), 1 tk. 5. Mahutavuslik sond KA6, 1 tk. 6. Induktiivne sond LA5, 1 tk. 7. Kõrvalklapid mikrofoniga HM12 (3.5 mm pistik), 1 tk. 8. Kasutusjuhend Inglise, Soome, Rootsi või Vene keeles, 1 tk. 9. Kandekott KPP5 (nailon, 240x130x180mm), 1 tk.